I’ll be the first one to admit I totally skipped right over that Whole30 reintroduction element during my first Whole30. It wasn’t because I immediately grabbed the nearest bag of Fritos once the clock struck 30 days. And it wasn’t because I didn’t read the “fine print” about bringing back the foods I had removed. It was because my deep rooted, long standing food habits were not going to be fixed in 30 days. I needed more time on the program – but that doesn’t mean I didn’t do a reintroduction. I just did it when I knew I could handle reintroducing dairy without it turning into a large pizza consumed while I sat on my bed alone. The whole point of completing a Whole30 is to find out how to eat to feel your best afterwards. We do this by removing the potentially troublesome foods for a while, giving our body a break, and then systematically adding the food groups (dairy, gluten, soy, legumes, etc.) back in one at a time to evaluate. And yes, it needs to be one food group at at time. Think of your Whole30 reintroduction like a science experiment with different variables. You wouldn’t throw all of your test chemicals (variables) into a tube at one time to see what they did to the water (experiment), now would you? How would you know which chemical it was that made the water turn yellow? Was it the same chemical that also made the water fizzy? Which of the four chemicals had no effect? To make sure you know exactly what food is doing what, you’re going to do it one at a time. 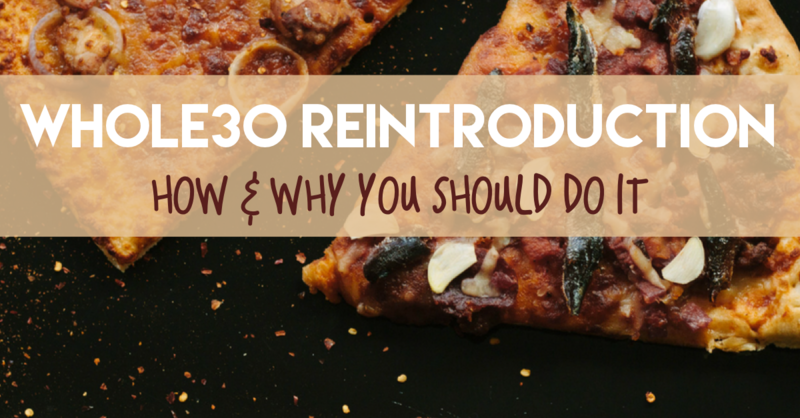 Completing a reintroduction is crucial to what Whole30 calls “Food Freedom”. 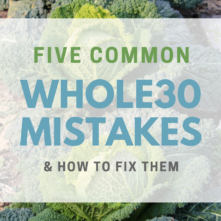 By taking the things you learn during the reintroduction phase into the real world, you’ll be equipped with all of the knowledge you need to make sure you feel as good as you did while on your Whole30. You can choose to leave out the foods that reintroduction showed you were harmful to you physically or mentally. And, you’ll be able to weigh the pros and cons of eating those foods anyway in a situation where you’re wondering if it’s worth it to eat something that makes you feel less than your best. You won’t get this benefit of the Whole30 if you hit day 31 and “celebrate” your accomplishment by eating all the Chinese takeout, ice cream, Teddy Grams and margaritas you can manage. You get one shot at seeing how potentially problematic foods impact you. Get the book Food Freedom Forever to help you navigate your life after Whole30! This is the way I phrase the question every time I’m evaluating if I truly want a food that my Whole30 reintroduction told me my body doesn’t appreciate me putting into it. More often than not, I would rather skip the food and value feeling awesome over a meal that’s not so great, not so special, or available to me at any time I want it. But I can also use this question to allow myself to have the things that are special and worth it because I weighed the benefits vs. downsides and decided it was worth it. 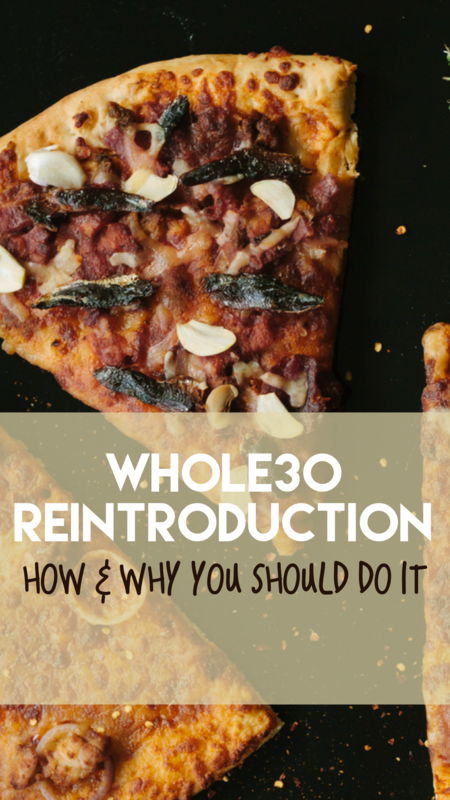 So, how does Whole30 reintroduction work? Day 31: Continue eating Whole30 compliant, but add legumes to your day. Ways you can do this is by having hummus with veggies, a Whole30 compliant taco salad with black beans, peanut butter on your banana, soy sauce in your otherwise Whole30 compliant cauliflower fried rice. You’ll want to pay attention to how you’re feeling both immediately after, and throughout the next day. With that information, you can decide how much and how often (if at all) legumes should be added to your regular day-to-day diet. Other legume options: peas, chickpeas, edamame, miso, lentils, kidney beans, pinto beans, or other bean varieties. Days 32-33: Eat Whole30 for these two days, continuing to evaluate your experience after legumes. Day 34: Continue eating Whole30 compliant, but add gluten-free grains to your day. Ways you can do this is by having white rice with a Whole30 compliant dinner, some corn chips with a lunch, or gluten-free bread for a sandwich with Whole30 compliant ingredients. You’ll want to pay attention to how you’re feeling both immediately after, and throughout the next day. With that information, you can decide how much and how often (if at all) gluten-free grains should be added to your regular day-to-day diet. Other gluten-free grain options: corn, brown rice, gluten-free oats, popcorn, quinoa, buckwheat. Days 35-36: Eat Whole30 for these two days, continuing to evaluate your experience after gluten-free grains. 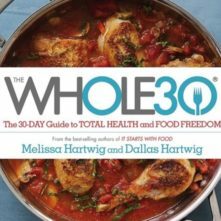 Day 37: Continue eating Whole30 compliant, but add dairy to your day. Ways you can do this is by having a healthy yogurt option, cheese with your eggs or over an otherwise Whole30 compliant casserole, and adding creamer to your coffee. You’ll want to pay attention to how you’re feeling both immediately after, and throughout the next day. With that information, you can decide how much and how often (if at all) dairy should be added to your regular day-to-day diet. Other dairy options: milk, sour cream, butter, half and half, condensed milk, cottage cheese. Days 38-39: Eat Whole30 for these two days, continuing to evaluate your experience after dairy. Day 40: Continue eating Whole30 compliant, but add grains containing gluten to your day. Ways you can do this is by having toast or a muffin with your breakfast, slices of bread or dinner rolls, or pasta noodles. You’ll want to pay attention to how you’re feeling both immediately after, and throughout the next day. With that information, you can decide how much and how often (if at all) grains containing gluten should be added to your regular day-to-day diet. Other grains containing gluten options: crackers, tortillas, oatmeal, breakfast cereal, bagels, English muffins, pancakes, pretzels. Keep track of how these foods affect you that day. It could be immediate, or hours later, or even the next day. Did you need a nap after grains? Was it harder to get out of bed the day after dairy? Did soy give you a headache and make your stomach feel weird? These will be different for all of us – but it’s so important for you to know what these foods do to you so you can go forward choosing when they are and are not worth it to consume! Plan out what things you’ll reintroduce. Don’t wait until the day of to decide, or you run the risk of saying screw it I’ll have whatever I want! So, write out which foods they will be and then you’ll have your list for the grocery store too. Example: soy sauce in a Whole30 sweet and sour chicken, peas in an otherwise Whole30 compliant stir-fry for dinner. Gluten free chips or corn chips with an otherwise Whole30 compliant taco salad for lunch, pasta for an otherwise Whole30 compliant slow cooker Bolognese sauce. Cheese over a pizza spaghetti squash meal, heavy cream in a Whole30 potato and bacon chowder or creamy chicken soup for dinner. A plain bagel with almond butter for breakfast, two pieces of toast to make an otherwise compliant Whole30 sandwich for dinner. It helps to keep track of how you’re feeling by writing it out as it’s happening. Even if it’s as simple as a note in your phone! This is helpful because as you get further removed from the 40 day experiment, it becomes easier to slide back into habits as you slowly forget how you felt when dairy gave you horrible stomach cramps and made you break out in pimples the day after. By having these little notes to yourself, you’ll further enforce and engrain your new habits! And you deserve these new habits you’ve worked hard for! You deserve to be feeling your best, on the Whole30 and after. Question for you – what if you never felt awesome on the whole30? How do you evaluate these foods? Do I then decide if I feel worse than I felt on the whole30? I had bloating and upset stomach and tired just as much (or more) on the whole30 than before. And I’m confused as to how to reintroduce. It’s tough to answer that question – did you not feel awesome because of chronic conditions that were causing those symptoms? If so, do you need more time on the Whole30? For your reintroduction, I would add back the foods and just see what happens. If you’re already not feeling great, inflammatory foods might make you feel worse, as you mentioned. But then you’d be able to see if the Whole30 actually *did* make you feel better while you were on it. How do you go about reintroducing sugar and SWYPO foods like baked goods? Sugar is difficult to avoid completely when you’re reintroducing the other food groups. Almost all bread/grain product contains added sugar, same with dairy products. It’s tough to avoid. However, you could add a day where you reintroduce sugar options like honey, cane sugar, maple syrup, stevia, or your favorite sweetener to see the impact it has on you. As far as reintroducing SWYPO foods, those would fit into the other food group categories. That’s part of what you’re going to be evaluating when you reintroduce them (i.e. – tortillas / ice cream / muffins). You want to not just look at physical side effects from eating them, but how you’re feeling mentally and emotionally. Did you feel in control while eating them, did it make you just want more and more junk during the day? Did you use your grain reintroduction day to eat a whole bag of chips? Just like the physical side effects, these things will help you decide if the foods groups/SWYPO should be a part of your life post-Whole30, and when it would be worth it to allow them. P.S. I noticed in your list of days that days 38-39 said to evaluate “gluten-free grains”. Should that be “dairy” instead? Wow, this is so helpful! You are just the best resource!! Help!! Once I’ve reintroduced a group, do I keep it in my diet. Like if I reintroduce dairy, 3 days later on my next reintroduction do I still eat dairy but then add legumes, or just legumes? This is the only bit that I struggle with.